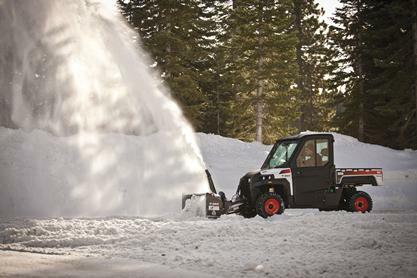 Throw and blow snow to clear a clean path with the snowblower attachment for Bobcat® 3650 utility vehicle. By using direct power provided from the PTO on your 3650 UTV, the snowblower easily cuts through and tosses deep snow. A large 12-inch-diameter auger provides plenty of capacity to make short work of snow removal. Bobcat snowblowers are easy to use, simple to maintain and will blow as much snow as you can push into them. Height adjustment and chute rotation are hydraulically operated and controlled by a joystick from inside the cab. The ability to raise the blower off of the ground makes clearing deep snow or cutting through banks easier. Cut through packed snow by lowering the blower below grade to allow for additional weight to be exerted on the cutting edge. Toss snow in hard-to-reach places such as the middle of lawns, ditches or wooded areas alongside a path. The snowblower attachment is the ideal winter cleanup tool, especially for homeowners with acreage and grounds maintenance crews. Adjustable and Replaceable Skid Shoes: Control the cutting depth on irregular surfaces such as gravel driveways. Adjustable Snow Deflector Spout: Manually adjust the snow discharge height up to 90 degrees. Bolt-on Reversible Cutting Edge: Enjoy long edge life and easy maintenance. Hydraulic Chute Rotator: Use hydraulics to rotate the chute and throw snow exactly where you want it with 227 degrees of rotation. Large Fan Diameter: Move large amounts of snow with the 14 in. fan diameter and 12 in. auger. Multi-Attachment X-Change™ (M.A.X.) System: Makes easy work of attaching and detaching the snowblower from the utility vehicle. Fast and easy mounting means spending less time on attachment changes and more time on the job. Shear Bolts: Protects the snowblower’s driveline. Two-stage Blower Design: Takes in snow while the impeller blows it up and out of the chute. Uptime Protection: Steel edge and skid shoes are replaceable.